Instead of creating a physical artifact, Lomberg suggested creating a digital one: streaming data to the spacecraft once it had completed its study of Pluto and its moon Charon. He referred to it as a "digital Voyager record 2.0." "In a way, the history of long-term space message artifacts recapitulates the history of communications technology," Lomberg said. The plaques onboard Pioneer 10 and 11, launched in March 1972 and April 1973, respectively, engraved images on metal and stone. 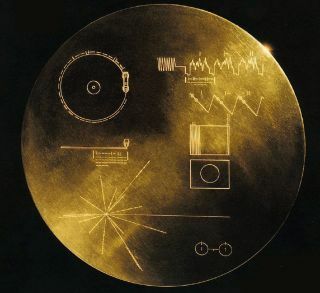 Voyager's record was an analog recording on a record that few young people would know how to operate today. NASA's Phoenix mission to Mars carried digital recordings of literature and art about the Red Planet in 2007. By Feb. 18, 2014, Lomberg had gathered 10,000 signatures from 140 different countries. In May, at Smithsonian magazine's "The Future is Here" Festival in Washington, D.C., he announced that NASA had given his team the go-ahead for the project. "I think you could hear us cheering all the way out to Pluto," he said at the festival. An official announcement will be made Aug. 25, and will include information about the submission process and deadline. An artist's image of the New Horizons spacecraft as it approaches Pluto and its moon Charon in July 2015. To accomplish the task, Lomberg and Albert Yu-Min Lin, a research scientist at the University of California, San Diego, plan to crowdsource the project by seeking ideas and services from large groups of people. Lin has experience in combining citizen science with scientific explanation, including for his Valley of the Khans project, where people around the world combed satellite imagery in search of the tomb of Genghis Khan. A more recent project involved bringing 8 million people together to search for the missing Malaysian airline flight in a single weekend. People from around the world will be able to submit their images and vote on those that should be included in the final message. Lomberg and others will exercise editorial control to ensure that no inappropriate materials make the cut, and NASA will make the final call. When the spacecraft completes its mission and sends all of its data back to Earth, its computer memory will have room for a record from home. The One Earth Message will then be sent to the probe — a process that will likely take several days. "For almost 40 years, people have been inspired by the Voyager record, a portrait of the Earth in 1977," Lomberg said. "The world is very different now, and this new message will reflect the hopes and dreams of the second decade in the 21st century. It will inspire young people's interest in science and ignite the imagination of all ages. We hope it will be an example of global creativity and cooperation, something that the entire planet can share as a cooperative venture, made possible by the new science of crowdsourcing."